New from Schleich – prehistoric animal figures for 2019. Spinosaurus (top left), the nodosaurid Animantarx (top right), the Early Jurassic pterosaur Dimorphodon (centre), Giganotosaurus (bottom left) and the sail-backed reptile Dimorphodon (bottom right). The new for 2019 Schleich Spinosaurus model will replace the current obligate biped version (Spinosaurus violet). The German manufacturer has created a Spinosaurus dinosaur model in a true quadrupedal pose, this reflects the consensus reached about the posture of Spinosaurus aegyptiacus in a scientific paper published in 2014. Note that the sail of this figure has also been given a makeover with the new Spinosaurus sail much less rounded in shape than on previous incarnations. The tail is much more crocodilian and the colour scheme chosen for this replica is muted and understated. The new for 2019 Schleich Spinosaurus model, depicting Spinosaurus as a quadruped. This figure will have an articulated jaw. Also expected in quarter 1 of 2019, is the Animantarx model. An armoured dinosaur (member of the Nodosauridae family), from the famous Cedar Mountain Formation of the western United States (Utah). This figure is being introduced to the range, as 2019 marks the twentieth anniversary of the formal scientific description of this three-metre-long “living citadel”. 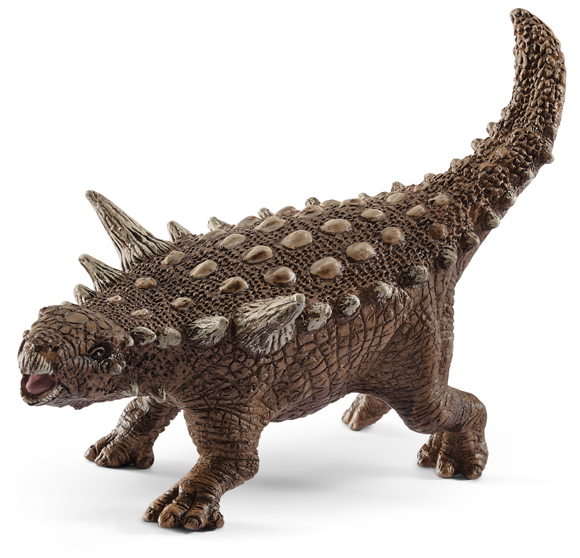 The Animantarx model is the first nodosaurid that Schleich has added to their model range since the retirement of the “Saurus” Edmontonia more than a decade ago. The Schleich Animantarx dinosaur model (new for 2019). Flying into view comes the Schleich Dimorphodon model, a beautifully-crafted replica of a flying reptile, fossils of which were found by the famous Georgian/Victorian fossil hunter Mary Anning. Unlike the majority of earlier Schleich pterosaur models, the Dimorphodon is not flying but modelled as a terrestrial animal, wandering around Early Jurassic forest floors on all fours. The Schleich Dimorphodon model (new for 2019). The “eyespots” on the wings are very distinctive and that large skull with its big teeth has been carefully sculpted. The tail too is also to be commended, it was very stiff and the “rudder” on the end might have been marked in some way to aid visual communication. The Schleich Dimorphodon is due to arrive in early 2019, looks like it could be a soar away success! A new colour version of the Dimetrodon will be introduced next year. The 2016 Dimetrodon figure with its reticulated pattern on the sail, is being retired and will be replaced by this, predominantly green model. Although, not a dinosaur and more closely related to modern humans than to animals such as Tyrannosaurus rex, Dimetrodon has been a staple of prehistoric animal ranges for a long time. It might be sad to see the withdrawal of the 2016 model, but at least with this new addition, pelycosaurs will still be represented within the Schleich range. New for 2019 Schleich Dimetrodon model. The last of the new for 2019 announcements features a replacement for the brightly coloured, orange Giganotosaurus figure, which first made an appearance in 2015. The colour scheme for the new figure is more subdued, when the paintwork on the new Spinosaurus figure is also considered, Schleich might be moving towards more subtle colouration on their prehistoric animal figures. If this is a trend, then these new colour versions of existing replicas may have a greater appeal with animal figure collectors as well as dinosaur model fans. New for 2019 Schleich Giganotosaurus dinosaur model. All these models are scheduled to be in stock at Everything Dinosaur in the first few weeks of 2019.